Final Fantasy Dissidia will be the very first PlayStation Portable-exclusive (and original, Crisis Core is a prequel) Final Fantasy title. On the outside, the game features characters from different Final Fantasy games participating in one-on-one battles. On the inside, it’s a game that feels looks and feels like a Kingdom Hearts portable. Final Fantasy Dissidia is a 3D action fighting hybrid although Square Enix describes the game to fall under the unique genre of dramatic progressive action. And yes, it does take the PSP’s graphics to a whole new level. Update: You can download a Dissidia ISO via Free PSP Games. This Comprehensive Guide to Final Fantasy Dissidia contains basic instructions to get you going into the game as well some advanced tips and tricks into the game. Now that the English version is out, there will be some major modifications throughout the whole guide. Be sure to bookmark and come back for more. Noting that there’s a diverse set of characters in the game, believe it or not, there’s actually a storyline that explains how all the Final Fantasy heroes and villains got together. Sounds Kingdom Heart-sy enough? You bet. Tetsuya Nomura is responsible for the Art department of the game so if it looks quite similar to the Disney-Square Enix team up you’ve grown to love, you know why. The gist is, a battle between Cosmos, the god of balance and harmony, and Chaos the god of disorder. The eternal war between these two is struck with a slight imbalance, leading to chaos filling the world. All hope lies in 10 warriors brought forth by Cosmos. If you’re thinking that the game will be short and straightforward though then you’re sorely mistaken. Keep hitting your opponent with combo attacks and he will drop small EX orbs that you can collect to fill your EX gauge with. If you wait for a while the EX orbs will be drawn to EX cores. There are two different EX cores, EX cores with one wing fills 1/2 of your EX gauge while two winged EX cores fully fills up your ex gauge. The EX gauge is the purple crystal bar next to your character image during gameplay. When the EX gauge is full you can enter EX mode. During ex mode you get status changing buffs like protect and haste and you get stronger and different combo attacks during EX mode. To enter EX mode, have your EX gauge full and then press square+cross buttons to activate EX mode. If you do a HP attack during EX mode, a square icon will show up on the screen. Press the square to perform a EX burst (note: if HP attack is successful, your BP Turns to zero like normal. you dont get keep your BP during an EX burst. Description: A fighter that can handle combat well from a distance as well as up close, he’s a well balanced standard character that can handle various situations well. Description: Out of all the quirky Chaos characters, he is the most standardized. 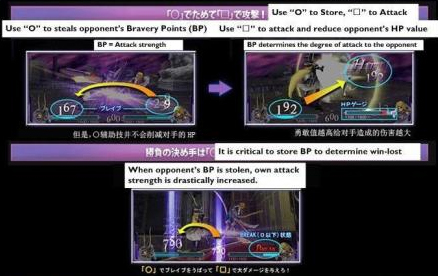 As powerful attacking character, his attacks adjust accordingly based on how hard the buttons are pressed. Description: Similar to his design in the game he originates from, he is a master of all weapon types. His various attacks will make use of various different weapons, giving him a variety of options. Description: He is a tactical character who can turn the environment against opponents using mines and homing magic attacks. There are many more tricks up his sleeve awaiting careless enemies. Description: This character has both melee attacks and magic attacks at his disposal, players can choose to focus on one style of play or mix both for a deadly combination. He is also the fastest character in the Cosmos line up. Description: Her movements are like a cloud dancing in the sky, and tentacles from her body reach forth to attack enemies. Her mastery is in using long range particle beams to keep her opponents at bay. Description: He has two completely different styles in a single character – the Dark Knight is a slow but strong offensive character that favors ground combat, while the Paladin is a mid-air specialist who is better rounded in both movement and defense. It is up to the player to change between the two styles during combat. Description: An unusual character with many tricky abilities. Every attack he executes is two attacks in one, each with a different range. Even though he wears heavy armor, his movement is not particularly restricted. Description: As a homage to the Mimic job class in the game he originates from, his attacks and skills are borrowed from all the other Cosmos characters along with their weapons. It is up to the player to best maximize the ability to string together attacks from different characters and create combos not normally possible with those attacks. Description: Most of his abilities and actions involve defense, but when he successfully guards from an incoming attack the resulting counter attacks will be brutal. Due to his play style, his movement is unusually slow. Description: The most balanced out of all the magic users in the game, she has both ranged and melee magic attacks in her arsenal. She can also follow up her spells with follow up combos. Description: While he is mainly a magic user, his attacks often have unpredictable motions and behavior that confuses the opponent. His spells can home in on the enemy, and his play style relies on taunting the opponent into making foolish mistakes. Description: His abilities favor hitting the opponent away with strong attacks. By throwing enemies against the environment with such attacks, they suffer additional damage on top of the initial strike. He also has various aerial attacks to follow up on enemies that have been hit into the air. Description: A true sword master who strikes at foes with attacks at light speed, to his opponents his sword is almost invisible. He has many attacks that work well, and any player should be able to find ones that they favor. Description: Like in the original game he comes from, his attacks are often consist of more than a single strike. The appeal of his abilities lie in how well they contribute to combos and keep the enemy caught in a string of melee attacks. Description: She’s mainly a long ranged spell spammer, and by rapidly pressing the buttons she can continuously string together a set of a spell combos. Her attacks also allow her to hold down a button to charge for stronger magic attacks. Description: A fast and agile character who leaps like a superhuman, the air is his playground. When transformed in his Trance mode, his mobility and speed are even greater. Description: Able to fly freely in the air without a care in the world, he is also able to easily change directions and break out of attacks in the middle of combat. As he is not restrained by gravity or normal physics, the range and distance between him and his opponent is largely meaningless. Description: A high mobility character that specializes on dodging the attacks of the opponent, and following up with a series of fast and deadly counter attacks. His skill set includes the Overdrives from his original game. Description: The strongest and most focused melee character in the line up, he has extremely high attack power and dominates in close range combat. He has many dynamic abilities and attacks, like the True Jecht Shot that where he kicks a meteor at the opponent. Description: As her Brave amount increases or decreases, so do her available spells. When she uses her sole HP Attack, she can also string it into a continuous combo, however the HP Attack can be rather challenging to pull off successfully. Now that the introduction is done, turn to the next page for the Comprehensive Dissidia Guide. what will be cool if later on you can download more characters and battle stages online. but there are two of them!! and i the EX Mode was awesome!!! and where can i find those yuffie card and cloud ghost ?? umm i can change costumes for the chars??? so how l can find costumes menu or option!!!!! am just wondering how to get the omnislasg ver.5 of cloud. you have to buy the skill. Does anybody knows if the american version of dissidia will have japanese voices or shameful english voices? I can’t even finish my first enemy in the first room!! jezreil kababayan! hehe la lng…. ei by the way this is a very cool guide! hey anyone knows what’s the best customization for TIDUS? he’s my favorite coz FFX is the only FF i finished… hehe! 300PP kelangan para makabili costume huhuhu! １０秒以内にマップに激突させる refers to crashing the opponent into any EDGE of the map (floor, sides, ceiling), not just any wall. can someone translate the weapons,accesories etc?? dissidia is a very easy game, once you learn to dodge your opponents attack then counter attack before they finish, making them unable to dodge your attack; sephiroth is a very overpowered character as he should be anyway, most of his bravery attacks will brave break on a single hit, meaning a follow up square before they are even off the floor will kill them but cloud has the best circle to square combo, its called finishing touch and its emense. Very useful guide, thank you. Anyone cleared inward chaos story yet?